The hand-launched RQ-20B Puma AE is powered by a long-endurance battery. Photo: Business Wire. A RQ-20B Puma AE being recovered on the flight deck of a Flight I Guided Missile Destroyer during a test flight conducted in August 2016. Photo: Business Wire. The RQ-20B Puma AE is an enhanced version of the RQ-20A, developed by AeroVironment. Image: U.S. Navy photo by Mass Communication Specialist 3rd Class Bill Dodge/Released. RQ-20B is a block 2 upgrade of the Pointer Upgraded Mission Ability-All Environment (Puma AE) small unmanned aircraft system (UAS), designed and built by AeroVironment. The UAS is designed for missions such as tactical intelligence, surveillance, reconnaissance and targeting (ISRT), maritime patrol, search-and-rescue, and counter-illicit trafficking. It can be operated from a range of naval platforms such as patrol ships, transport vessels and guided missile destroyers. The drone also supports land-based operations. An RQ-20B aerial system, along with its precision recovery system developed by AeroVironment, was tested by the US Navy on a Flight I Guided Missile Destroyer (DDG Class) in August 2016. The tests were conducted to evaluate the performance capabilities of the UAS in the maritime environment. The base version of the Puma AE was initially developed for the US Special Operations Command in 2008. Its enhanced version, designated RQ-20A Puma AE, is operational with the US Navy Expeditionary Combat Command Coastal Riverine Forces, the US Marine Corps, the US Army, and a number of foreign governments. In October 2013, AeroVironment introduced the RQ-20B with a series of enhancements over the RQ-20A. The US Navy tested a RQ-20A UAS from a USS Monsoon coastal patrol ship in August 2016. The RQ-20B Puma AE unmanned aircraft system consists of an unmanned aerial vehicle (UAV), payloads, and ground control station. The UAV features a lightweight airframe with reinforced shell fuselage having improved aerodynamic capability. It has a high-wing monoplane design with a wing span of 2.8m. The drone is 1.4m-long, weighs approximately 6.3kg and can be easily assembled and operated by two people. It is able to be launched quickly either by hand or rail launch method from a range of naval vessels. It can operate autonomously through the predefined way points, using GPS-based precision inertial navigation system. A precision recovery system built by AeroVironment enables the UAV to automatically land into a net on the flight deck of the launch vessel. The drone can also be recovered by deep-stall landing method. The block 2 Puma AE drone carries an electro-optical / infrared (EO / IR) camera system and an illuminator in a lightweight, mechanically-stabilised gimbal payload pod fitted beneath the fuselage. The camera system provides target location, ISRT data, and digital high-definition imagery and video in both day and night lighting conditions. It can carry additional payloads such as laser marking system, communications relay and geolocation sensor in an optional under-wing Transit Bay. The UAS is compatible with Mantis i45 EO / IR gimbal payload developed by AeroVironment. The Mantis i45 sensor suite offers high-resolution imagery and video, as well as tactical ISR capability. 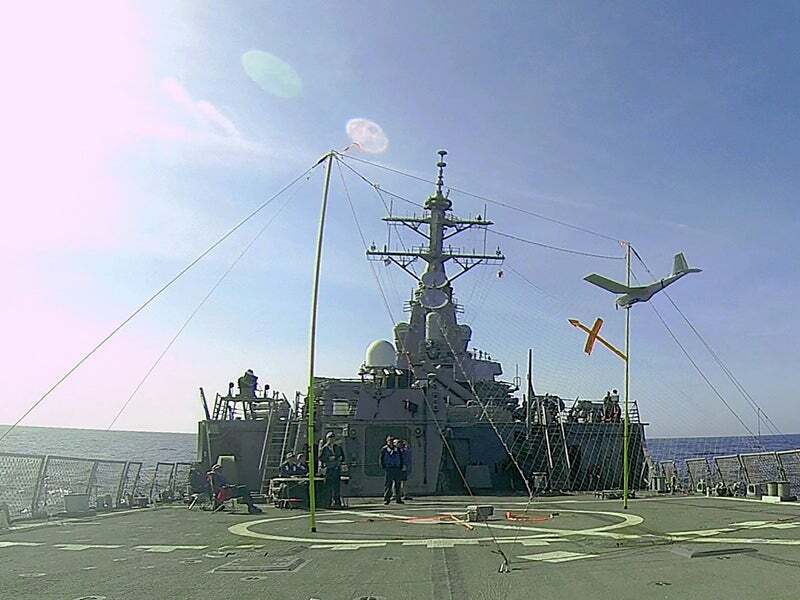 The operation and control of the RQ-20B Puma AE UAS is performed from the launch ship’s command and control system. A secure digital data lLink developed by AeroVironment transmits the real-time ISRT data collected by the UAV to command and control server, as well as to the operator’s communications network. The RQ-20B UAV features an enhanced propulsion system that allows for operation at higher altitudes in difficult climatic conditions. The propulsion system comprises a long-endurance battery, driving a two-blade propeller mounted in tractor configuration. The drone has the ability to travel at speeds between 20kt and 45kt and transmit telemetry data over a range of 15km. It can fly at 500ft altitude and offers a flight time of more than three hours. The RQ-20B can be provided with smart battery options for increased mission capability. AYESAŞ is a solution provider for naval hardware and software including design, development, testing, manufacturing and integration. iXBlue is a leading provider of navigation, imaging and positioning solutions for first-rank ships, submarines and autonomous underwater vehicles (AUV).